North Myrtle Beach Oceanview Condo Rentals - Grand Strand Resorts Inc. If you are planning a trip to the beach and want an ocean view, then Grand Strand Resorts can accommodate you over 100 different ways. Located in North Myrtle Beach, South Carolina, our company has been helping people like you fulfill their vacation dreams for decades. Not only do we have a myriad of properties unique as the next one, but we are situated so as to help you enjoy the main attraction of North Myrtle Beach and the Atlantic Ocean. Surely there are many housing options for you to choose from, but if you are looking for the best value without giving up luxury and first-class accommodations and amenities, then you have found the best North Myrtle Beach ocean view condo rentals available. With the ocean right at your front door, you can choose to dig your feet into the sand under an umbrella or lie back on a towel and soak in the sun. Enjoy a walk along the 9 miles of North Myrtle Beach coastline, run along the water’s edge for some exercise, or grab an ice cream at one of the piers after a delicious dinner as the sun sets. 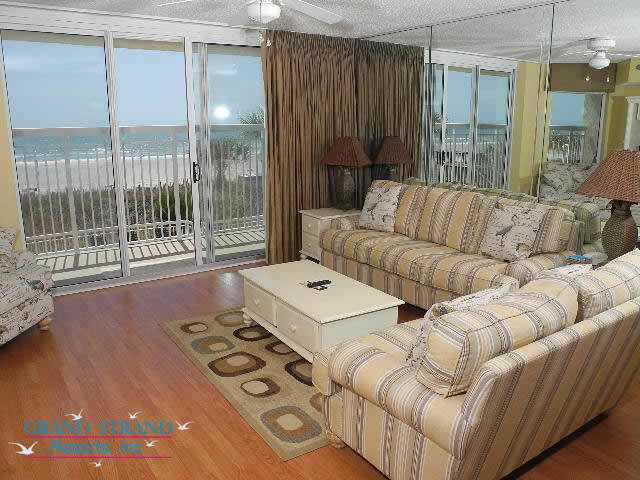 Why not get an ocean view condo on your trip to North Myrtle Beach and enjoy the fullness of what the beach has to offer? Grand Strand Resorts staff will gladly help you find the perfect North Myrtle Beach ocean view condo rentals around. Call us today. We represent over 100 ocean view properties in and along the Grand Strand. This means we provide an abundance of options for you, your family, and friends. With so many choices, how do you choose which location to stay? The following are a few examples you will find on our website to help guide you in the right direction. Of course, there are many more so feel free to spend time glancing at the other properties until you find a few you are interested in. Call us to answer any questions and help you make the best choice for your vacation.